We present a detailed study of the classical Cepheid in the double-lined, highly eccentric eclipsing binary system OGLE-LMC562.05.9009. The Cepheid is a fundamental mode pulsator with a period of 2.988 days. The orbital period of the system is 1550 days. Using spectroscopic data from three 4-8-m telescopes and photometry spanning 22 years, we were able to derive the dynamical masses and radii of both stars with exquisite accuracy. 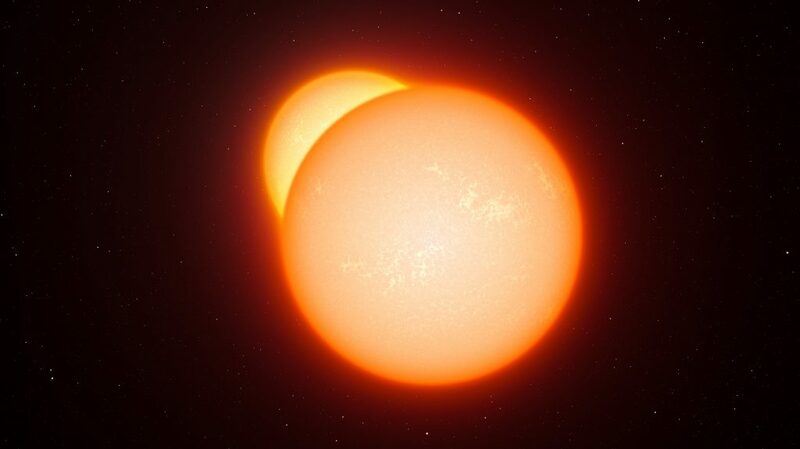 Both stars in the system are very similar in mass, radius and color, but the companion is a stable, non-pulsating star. The Cepheid is slightly more massive and bigger (M1 = 3.70 ± 0.03M☉, R1 = 28.6 ± 0.2R☉) than its companion (M2 = 3.60 ± 0.03M☉, R2 = 26.6 ± 0.2R☉). Within the observational uncertainties both stars have the same effective temperature of 6030 ± 150K. Evolutionary tracks place both stars inside the classical Cepheid instability strip, but it is likely that future improved temperature estimates will move the stable giant companion just beyond the red edge of the instability strip. Within current observational and theoretical uncertainties, both stars fit on a 205 Myr isochrone arguing for their common age. From our model, we determine a value of the projection factor of p = 1.37 ± 0.07 for the Cepheid in the OGLE-LMC562.05.9009 system. This is the second Cepheid for which we could measure its p-factor with high precision directly from the analysis of an eclipsing binary system, which represents an important contribution towards a better calibration of Baade-Wesselink methods of distance determination for Cepheids.